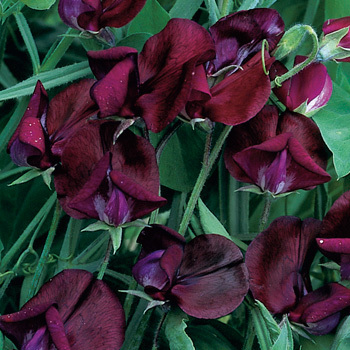 Sweet peas revel in moderate summer areas with nights that cool down, blooming all summer long in these areas. However, they can be grown successfully in the border or in cutting gardens in warmer areas- just with a shorter bloom time, as temperatures consistently above 80F will signal the eventual end of blooming. Provide humus rich soils and a trellis upon which tiny tendrils can grab hold and pinch once when 6" tall to increase branching. Deadhead or cut daily for bouquets, as any seed-setting will signal the plant to cease blooming. Watering Details: Keep fairly moist—at least 1" per week, more during particularly dry spells. Plant: Sprawling bushy plants 2-3' or vines 6', sometimes up to 8' tall (depending on choice to use support) and 1-2' wide with winged stems, darker green paired leaflets, and tendrils for climbing.